Growing up, you will have been taught about the importance of brushing your teeth. But, did you ever think that simply by brushing, you could be doing damage instead of good? Believe it or not, there is a right way and a wrong way to brush your teeth. Poor dental hygiene doesn’t just lead to tooth cavities, inflamed gums, tarter or bad breath. The state of your teeth has a far deeper connection to your overall well-being than you may realise. Medical professionals have long been aware of the connection between gum disease and other serious ailments in the body, such as cardiovascular disease, diabetes mellitus and a host of other systemic related illnesses. There are hundreds of gadgets and gimmicks on the market, looking to cash in on people’s desire to have a mouth full of pearly white teeth. But by simply knowing how to look after your teeth correctly, you won’t need anything more than a few everyday items and a regular routine. 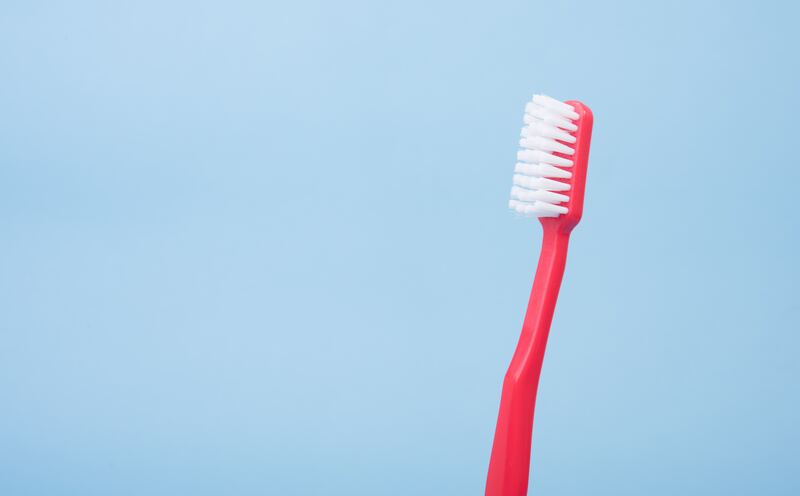 In an attempt to set the record straight on good oral hygiene once and for all, Expat Republic spoke with Sanam Khosrawi, a dental hygienist at Lassus Tandartsen. The practice not only specialises in providing high-quality dental care services to an international customer base, they are also an authority figure on lifelong oral hygiene and health. Choosing the right type of toothbrush is crucial to the peak condition of your teeth. However, there is no single correct toothbrush across the board. As each case is different, it is recommended that you discuss this with your dentist or dental hygienist. They will be able to advise on whether you should be using a soft, medium or hard-bristled toothbrush. There is evidence, however, that electric toothbrushes do a far better job of cleaning the teeth when compared to manual brushing. 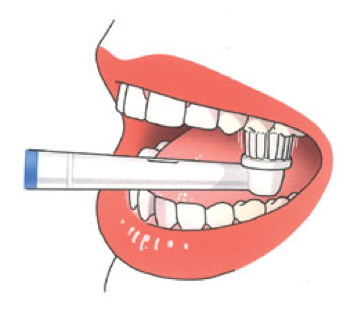 Once you have chosen the correct type of toothbrush, it is also important to replace it on a regular basis. In general, the advice is that you should change your toothbrush, or the toothbrush head, every three months. 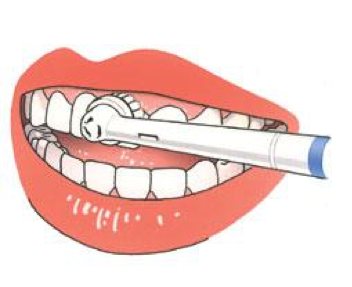 However, if in advance of the three-month mark your toothbrush is cloven or matted, it should be replaced. Sanam suggests this is also a sign that you are brushing too hard. Along with the perfect toothbrush, there are a couple of other items that are essential additions to your oral care arsenal. 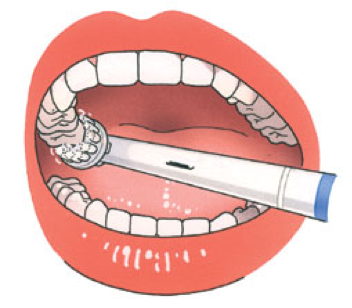 Brushing alone cannot clean away all bacteria. 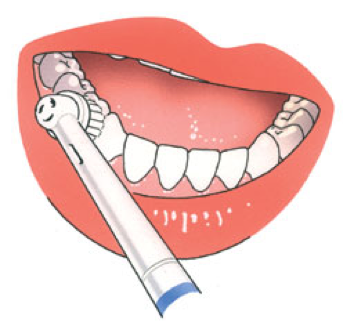 You will also need to use interdental devices to reach between teeth. Depending on the gaps between your teeth, you can choose between dental sticks, brushes or floss. Whilst evidence shows that interdental sticks and brushes are more effective, if your teeth are crowded and the spaces between them are small, dental floss should be used instead. In general, the best time to use alcohol-free mouthwash is after lunch rather than after brushing. However, mouthwash and mouth gels should only be used after consulting with your dentist. This is because there are many products on the market, therefore you need to know what the ingredients are and what they do. In order to keep your gums and teeth as healthy as possible, brush twice a day. You should spend at least two minutes on the process each time. Ideally, you should wait about 30-60 minutes after eating before brushing teeth in the morning and before going to bed. 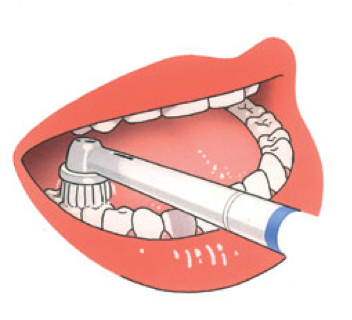 By brushing once a day, only 45 percent of bacterial plaque is successfully removed. 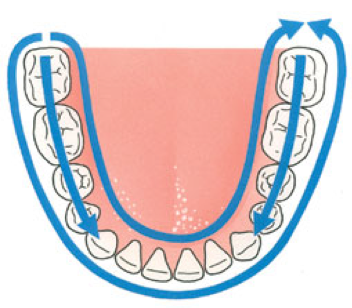 – Divide the mouth into four quadrants and brush each quadrant in three steps: outside, above and inside. 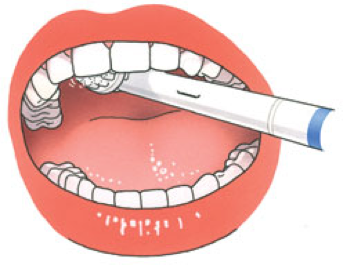 – Place the brush against the gum line of the tooth and brush every single tooth individually. 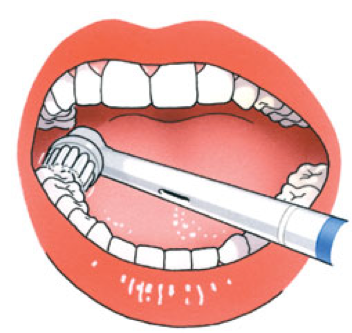 In case you are using a manual brush : place the brush against the gum line at a 45-degree tilt and move carefully fore and backwards. Use a soft headed brush which is more gentle to your gums and hold the brush at the end of the steel so you don’t brush too hard. In an attempt to be thorough, you may be tempted to brush as vigorously as you can. But brushing too hard can damage the gums and the enamel on your teeth. Bacteria can gather at the gum line, therefore, brushing with your toothbrush head at a 45-degree tilt will ensure you include the gum line when brushing your teeth. The tongue is home to a large amount of bacteria. Giving your tongue a good brush, especially first thing in the morning, can help to remove harmful bacteria and improve your breath. It is understandable to want to clean your teeth straight after eating. However, due to elevated acid levels caused by food, this is when your tooth enamel is at its weakest. Therefore, it is recommended to wait at least an hour after eating before brushing your teeth. Don’t skip a single brushing session, and make every brushing count. Once bacteria in the mouth is successfully stirred up regularly, there will be less of a damaging effect on teeth. Don’t rush the process of brushing your teeth. Regardless of whether you are tired or in a hurry, you should be in the habit of spending two minutes brushing each and every time. It is also important to stay focused and be mindful of the act when you are brushing your teeth. For the sake of your health, this is one time that multi-tasking is not recommended. Choosing the right dental care products and routinely brushing the correct way will have positive benefits to your overall health. But what you consume also plays a part in maintaining healthy teeth. Studies have found that tobacco use may be one of the biggest risk factors in the development of periodontal disease. People who smoke are more likely to produce bacterial plaque, which leads to gum disease. A lack of oxygen in the bloodstream means that your immune system is unable to heal the infected gum. We probably all know that sugary foods and drinks are bad for the teeth. But there are many other types of foods which can cause harm to our teeth. A carbohydrate-rich diet, or frequently consuming unhealthy foods, can lead to the formation of plaque on teeth. Any food with a high acid content, such as acidic fruits and juices, should also be limited as it can cause erosion to the enamel. Once this has worn away, it can’t regenerate. Not only that, this can also lead to a reduction in your vitamin D, C and B12 levels which are of great value to the bones and immune system. All of the above expert advice will help you maintain strong teeth, healthy gums and a more robust constitution. But as with all medical concerns, when in doubt you should talk to your dentist or dental hygienist. As Sanam reminds us, that’s their job and they are there to help.